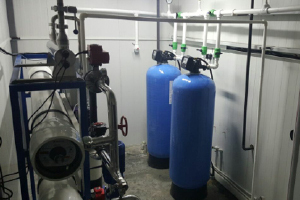 Our water treatment system is designed to take both raw lab-analyzed water and raw water supplied from wells in line with client demand and attain processed water quality. 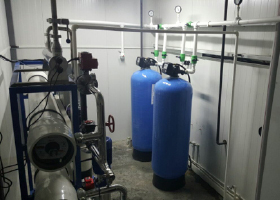 To do this we have used a chlorine dosage system, sand filtration, active carbon filtration, an antiscalant dosage system, reverse osmosis, and an ultraviolet disinfection system. In the first step, the project’s raw well water resource is taken to the raw water tank and disinfected through the chlorine dosage system. After this step, the disinfected well water is passed through the sand filtration system and suspended solid matters and residues are removed. The active carbon filtration system in the next step filters out all taste, odor, color, chlorine and chlorine compounds, as well as organic substances, that are present or are likely to be found in water. Water that reaches the reverse osmosis unit is purified of heavy metals and microbiological pollution and in the last step it is disinfected with an ultraviolet device to ensure its safe use. 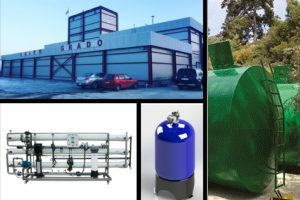 This project’s system was designed and manufactured in our center located at Istanbul, Turkey and delivered to Georgia. A.O. Smith’s expert engineers delivered the system in operational state to the customer after they performed on-site installation, the necessary controls and provided staff training.